Blogging: new thing. Blogging about: old things – well, sort of. I’m an archivist, and in my blog entries I’d like to take you on a virtual tour of B.C.’s past via records in the B.C. Archives. Some are indeed “old,” but others are relatively new. All of them give us a glimpse into the way things were. It’s a bit like time travel, without the trouble of landing on the wrong planet in the wrong era. At the Archives we’ve got a way-back machine, and its fuel is photos, manuscripts, sound recordings, films, maps, books and government records. There are a lot. We think we have something like 3 million photographs, but we haven’t finished counting (let alone scanning). Books – probably upwards of 80,000. Maps – 68,000 (at least). Boxes of records – more than 75,000. Films – 4,000 plus. You get the picture. It’s a vast resource – and they all record some aspect of the history of B.C. and the Pacific Northwest. They are the raw material of our individual and collective history. They’re also all waiting for someone to have that “Ah Ha!” moment, when a document turns out to be the missing link that proves a point, settles a boundary dispute, or fills in a branch on someone’s family tree. I’m lucky because I often get to tag along with our researchers on these voyages of discovery, and I’m also going to be able to blog about them. Most of the time I can give tips on how to make our website cough up sources of information. For example, if Sean, my fellow blogger had wanted more images relating to Captain James Cook I could have found him 38 images in our collection – everything from Cook’s boyhood home in England, to the beach and natives at Friendly Cove in Nootka Sound, ca. 1870. Sorry, couldn’t resist, but now I’m on a roll with the bathroom examples….. Anyway, if you’ve forgiven me the bad pun, check in periodically for a look at some of our more interesting records and where they can take you. Next up, all in one family – a disinherited and intestate son, the missing brother, an affair between a brother and sister-in-law, and death by Jeep and a Tesco’s lorry. For those interested in searching for specific records relating to their own research interests, visit our website at http://www.bcarchives.bc.ca/ - or call us at 250-387-1952 (toll-free through Enquiry B.C. 1-800-663-7867). In my role as communications coordinator, part of my job is to discover (and share!) cool and interesting Royal BC Museum stories. Wait… I get paid for this? Each of the men on the expedition had a distinct pennant to fly from their sleds. Usually sewn by the explorers’ mothers and wives, pennants were also hung at the base camp during special occasions and major sledge journeys. 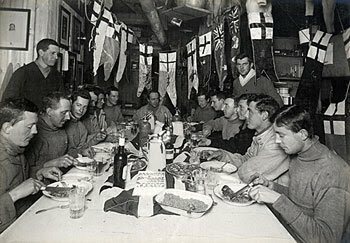 Meares’ pennant can be seen in this photograph taken during the expedition (see the man standing on the right? Look at the flag right above his head and count three to the left). Meares himself is sitting at the table, second from left. (Photo credit: © Royal Geographical Society, with IBG). It so happens that the American Museum of Natural History is about to open an exhibition based on the Scott expedition. Since Race to the End of the Earth is presented in collaboration with the Royal BC Museum, it only made sense to include the Meares’ pennant in the exhibition. 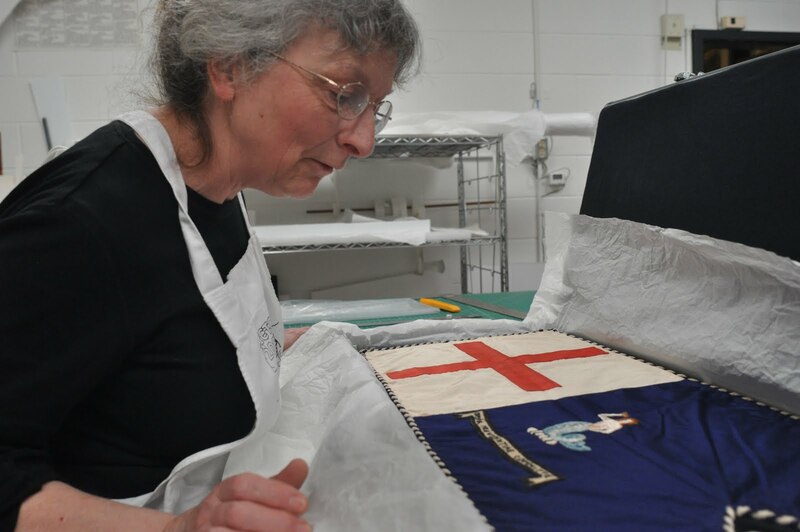 But before the 100-year-old flag could make its 4,800 km journey to New York, the Royal BC Museum conservation department had to make a few repairs on this delicate artifact. Race to the End of the Earth will focus on both the Norwegian and British expeditions to the South Pole and on the challenges both crews faced. Highlights of the exhibition include authentic clothing and tools and life-sized models of the base camps. 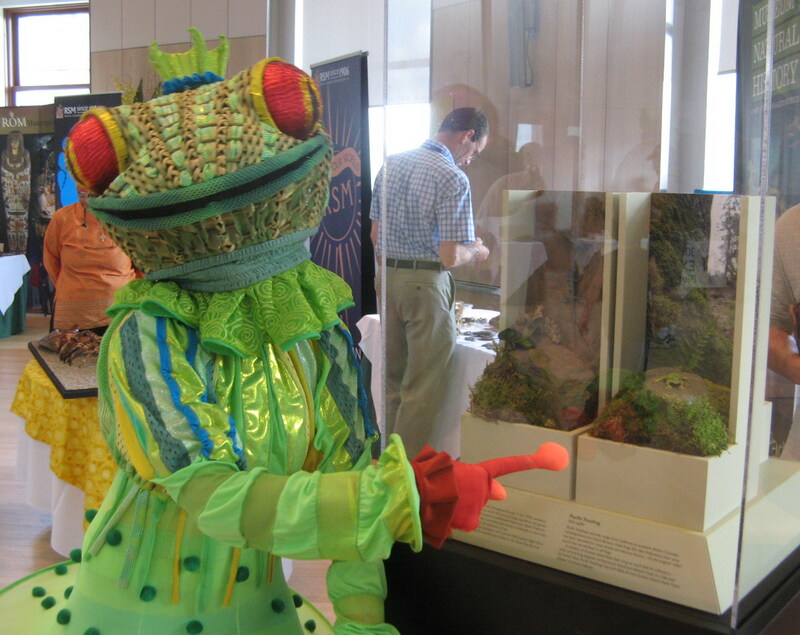 The exhibition travels to the Royal BC Museum in summer 2013 – stay tuned for more information. Is there is anything you ever wanted to know about the Royal BC Museum (but were too afraid to ask)? If so, leave me a comment and I’ll see what I can do to address it in future posts. I’m looking forward to sharing more museum stories with you! Be sure to check out author Adrian Raeside’s book: Return to Antarctica: The Amazing Adventure of Sir Charles Wright on Robert Scott’s Journey to the South Pole (2009 by John Wiley & Sons Canada, Ltd). This is one of the “coolest” blogs out there!